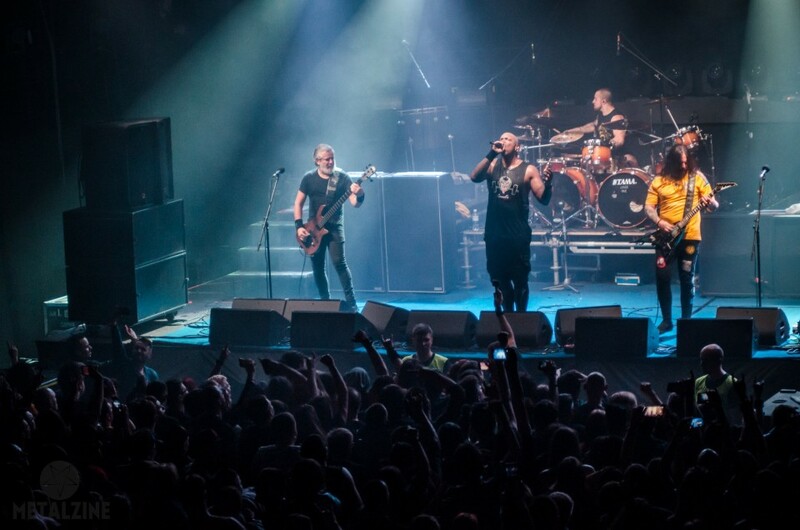 On April 9, the Brazilian metal band Sepultura played at the Bingo club in Kyiv. The show in support of the 14th studio album "Machine Messiah" (2017) was the first in the capital of Ukraine over the past 10 years. Fans of different ages had time to miss the band which celebrates its anniversary this year. And both of them did their best that evening. Noizr Zine visited the gig and is ready to share our impressions. The talks about Sepultura’s arrival began in December of the last year. Then it was announced that the band was going to visit Ukraine with three their shows — in Kharkiv, Kyiv, and Lviv. In the last one, they already give a performance as headliners in August at the major local festival. The Brazilian metallers gave new shows in support of their not very "fresh" album, but for real fans, it didn’t matter. Here they were really missed. Moreover this year the pioneers of thrash metal second wave celebrate their 35th anniversary, despite there are no original members left in Sepultura. The show was announced for 8:00 pm, however, the musicians themselves took the stage only at 9:30. About an hour before their appearance the guys from Minatox69 — relatively young metallers from Italy — tried to warm up the crowd. At some moment, the glorious five seemed to appear out of nowhere on a dark stage and immediately struck their strings. The guitar rattle and roaring vocals at once stifled the talks of the crowd. The hall apparently became surrounded by walls of noise. Despite the apathy of a few hundred guests and a merciless low-quality sound, the next hour the Italians confidently unloaded to the crowd their chaotic metal. From song to song, the vocalist asked people whether they were ready for the next unremarkable track. Naively promised a real explosion and asked to support Sepultura. At first, it seemed that the poor sound, which did not allow to hear a word, was the core of troubles. However, pretty soon Minatox69 showed that the matter was also in them: the musicians with their monotony and teenage jumps on the stage made the listeners bored rather quickly. Those who looked for the latest Sepultura setlists probably knew about their new intro in this tour. Therefore, when after a 20-minute fuss on the stage the Titas’ punk hit "Policia" boomed in the columns, the guests began actively engage the stage. Sepultura started confidently and powerfully with "Bestial Devastation", grasping "Troops of Doom" and "Escape to the Void". By the fourth song, "Beneath the Remains", the stage was no longer able to get through — the fan zone gradually turned into a restless whirlwind of metalheads with a great desire to knock around. Guitars no longer cut the ear, and the vocals did not merge with the instruments, while, alas, the sound terribly hit the ears. It was a great pleasure to watch (almost) 50-year-old Sepultura members. It would seem that four metalheads just playing their trademark heavy music with short breaks between tracks. However, the audience, who was still able not only to listen but also to watch their performance, certainly noted the competent well-coordinated work of such different musicians, honed by years of joint work. The young drummer Eloy Casagrande also fit the band very well. Today, this guy is only 28 and he plays in Sepultura already eight years. With the loud satisfied hum of the crowd, Sepultura played their classics: "Dead Embryonic Cells", "Territory", "Attitude". The hustle at the scene became more intense. Derrick Green repeatedly thanked the audience for the welcome, he noted that the band is very pleased to return to Kyiv. The musicians recalled that they celebrate their anniversary this year, and on the occasion of this date they prepared a setlist of 21 songs. 100% hits, which caused a pleasant feeling of nostalgia, remained for dessert. 20 minutes before the end the metallers seemed to have a second wind. The favourite classic songs from 90s music channels Sepultura gave without pauses: "Arise", "Refuse/Resist", "Ratamahatta" and "Roots Bloody Roots" provoked massive attacks of uncontrollable movements in the crowd, real adrenaline rush, and excitement. It was my first Sepultura show. Of course, this is no longer the band that I would like to hear live (although, perhaps, this is only a subjective opinion). But the vigorous four still arouses great interest and convinces that the story of Brazilian trash veterans was not finished either in the 1996 or ten years later. It can be said with confidence that the guys will visit Ukraine more than once again. Here they are very welcome guests.